Using a defibrillator in an emergency could help to save a person’s life. Recently, there have been a lot of cases hitting the news, where an AED (Automated External Defibrillator) has been vital in assuring a person’s recovery. Although an increasing number of defibrillators are being installed across towns and cities across the UK, many studies suggest that members of the public simply do not know what a defibrillator is. More importantly, those who are aware of this vital piece of lifesaving equipment, are unaware of the location of their local defibrillator, or how to use it in an emergency. In addition, many large companies and organisations do not have a defibrillator on-site, which is very worrying indeed. Allowing public access to a defibrillator increases the chances of a person being successfully treated for a cardiac arrest. However, a study led by the University of Warwick suggests that many people are very reluctant to use this type of equipment. Another study published in the European Heart Journal – Quality of Care and Clinical Outcomes, suggests there are a number of key factors preventing members of the public from using defibrillators. Being afraid of using an AED is becoming a real issue, as many lives could be saved with proper awareness and training. Imagine how many more lives could be saved, simply by having access to a defibrillator? The British Heart Foundation suggests “there are around 7 million people living with cardiovascular disease in the UK.” and that “Every minute without cardiopulmonary resuscitation (CPR) and defibrillation reduces the chance of survival by up to 10 per cent.” Therefore, it is vital that members of the public have access to AEDs, and they know how to use them when faced with someone who is suffering from a cardiac arrest. Moreover, organisations that employ a large number of people have a responsibility to ensure the safety of their staff at all times, especially in industrial sectors where the chances of a cardiac arrest naturally increase due to tasks such as lifting heavy loads. Why are people afraid of using an Automated External Defibrillator (AED)? Some studies suggest that many people are willing to use an AED but suffer from a lack of confidence and have an unfounded fear of harming the person needing treatment. Furthermore, many organisations have both confusing and conflicting ideas about whether they should install a defibrillator on-site at their premises. There are often concerns about liability, necessity – whether there is a local hospital nearby that can cater for emergencies – and whether company employees have the right training to use a defibrillator. What’s more, many businesses worry about the overall cost to install and maintain this item of equipment. However, how much would it cost your business if you lost a life that could be saved by having an AED on-site? An increasing number of people are seeing the value of having access to an AED. Usually, many public-access AEDs are often acquired by donation or fundraising rather than private purchase, but we would like to see more AEDs installed on-site at premises owned by corporate organisations. 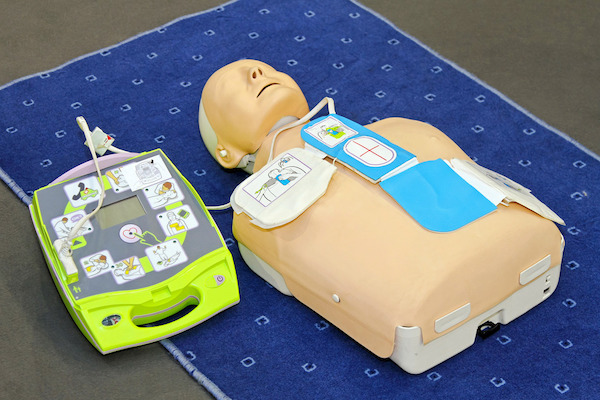 At LWS Training services, we provide training on CPR and how to use an Automated External Defibrillator. We also deliver a wide range of practical, hands-on First Aid and Health & Safety courses for businesses and members of the public.